While most of this blog covers my professional experience with SharePoint running on the windows platform, I’ve also spent a bunch of time as a Mac user. In the past, I’ve almost always remoted into windows machines to get work done – SharePoint, Powershell, SQL Management Studio, etc.. all required this approach. A tool for interacting with Microsoft SQL Server in Azure from my mac. 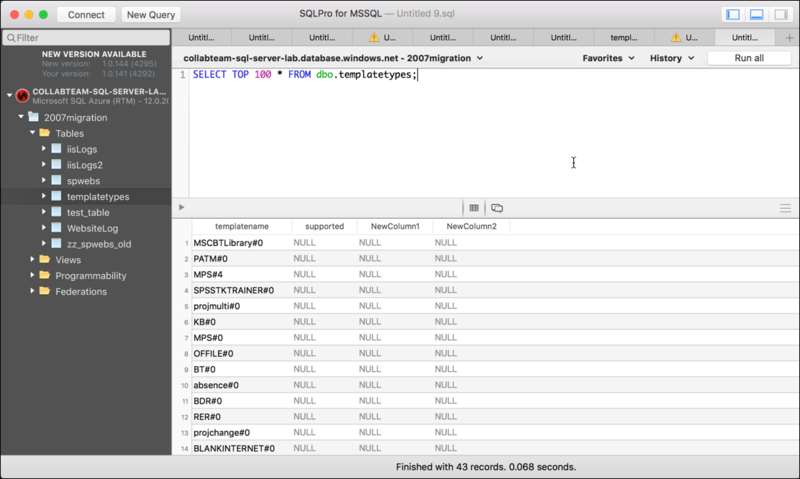 I tried a handful of options including some open source cross platform tools, some paid cross platform tools and a mac only gem called SQLPRO for MSSQL. The free options were kinda 1990’s java ugly. One wouldn’t even connect, and one connected but I ran into problems enumerating fields. Of the paid options, the best bang for the buck for me was Hankinsoft’s SQLPro for MSSQL. This tool is a native mac application (not a java port) and it shows: the app is fast, responsive, and looks like a mac app, supporting newer features such as the mac’s special full screen mode. I had no trouble connecting to PaaS SQL in Azure, and was able to do all the things I’d normally want to do. The tool has code completion, the ability to drag and drop field and table names from the navigation pane on the left to the editor, some nice features like the ability to auto indent sql code, and the ability to run multiple queries (separated by semicolons;) and display the results from each one in the results window, just like MS SQL Management Studio does! SQLPro was $79.99 as of this writing – This is a one time, buy it, it’s yours price, and it’s very competitive vs other tools that also offer the ability to connect to and work with Microsoft SQL server. So far I’m really enjoying being able to run queries against SQL in Azure natively on a mac – This is a great tool and highly recommended!